11 entries categorized "EASTERN REGION"
FOR WHOM THE BELL TOLLS !! SEEMS IRONIC THAT HAVING ONLY RECENTLY GOT THEIR FEET UNDER THE POWER STATION TABLE AS IT WHERE, BELL SHOULD BE WORKING AT ONE OF THE FIRST COAL FIRED POWERSTATIONS TO BE CLOSING DOWN. LETS HOPE THEIR STRANGE LOOKING TOY FINDS ANOTHER TASK TO KEEP IT BUSY. Dave Coleman, from Northampton Chassis Shop days, sent in the following for your delectation. Dave`s contact advises that﻿....."apparently that they are very good on the flat (so was Nijinsky !! ), but not good on inclines"....so the stockpiles would be good fun then.....last thing we knew about power stations was that scrapers were used to deposit coal on top of stockpiles, ie up inclines !! Do we sound a little cynical there ?? Good, because we meant to !! The Editors. 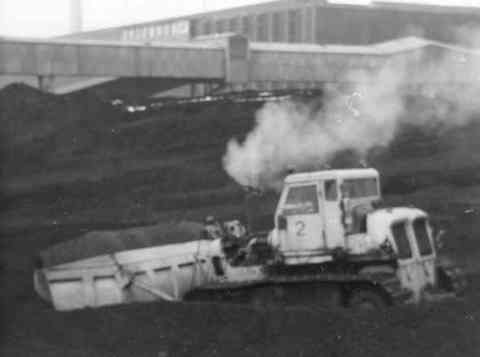 JOHN SMITH SPENT QUITE A FEW YEARS DRIVING ALL SORTS OF LOADING SHOVELS FOR ARC IN THEIR EASTERN REGION, AROUND WHITWICK QUARRY, LOUGHBOROUGH SIDINGS, AND OTHER SIMILAR LOCATIONS. 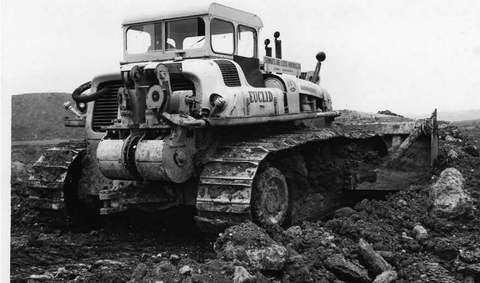 John made contact with us through a comment e-mail from the site, but has since filled us in with some more info, plus some tidy images of machines he drove during that era, so along with a couple of messages from him, we are treated to some ARC & BH Eastern Region images, some from almost 40 years ago. I worked at ARC Loughborough railway sidings, where ballast was trucked in by road from Whitwick and Shepshed (Charnwood) then loaded onto rail wagons. I did a few days down there when they were short of drivers, as I was driving loaders at Whitwick at the time, and I have enclosed a few images for you. You can post them on your site with pleasure. There is the Euclid L-20, Terex 72-41 (best loader ever in the world) a couple of Haulamatics and a oddball for you, a Cat 988 Dystread, this machine ended up giving me ulcers from the vibration. have loads more images give me a couple of weeks and I will scan them and pass them on to you, they are all negatives and I have thousands. By the way, years later Ii was involved in the removal of the remains of the Hunsbury site, as a haulier for GRS, I took stone in and crushed brick out, a sad day. .....and a group view now, L20, what looks like John`s 72-41, and a couple of Halumatic 615`s, or are they 625`s ?? Who is the Haulamatic expert ?? "Dear Editors, here are a few more. I`m off work at the moment due to high blood pressure (hgv driver) so found a few out whilst I had the chance. Still a lot more in there so will keep sending you some as and when I get chance. Also I have some images of Bardon`s equipment during the mid 70's. In the images of the Volvo loader you can see the very old euclid dumpers, we had 4 of them, then started getting the Barfords . I am a profile artist and have been looking for a side view line drawing for the 72-41 I used to drive, don't suppose you have one or know where I can get one from! 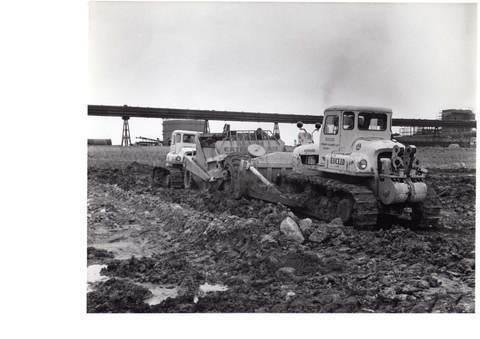 ......and back to Johns photos, we have his 72-41, the Haulamatics again, an early Volvo loader, then some SN35`s belonging to AB Hire, another name from the past, which are standing in front of a couple of early R-35`s Euc or Terex`s, could be either from that distance, and lastly, the real oddball, the Cat 988 Dystred, so called because it had metal "tyres" clamped around the rubber ones, an early form of tyre chains, but a lot less comfortable to drive on, as John commented. ....general shot of another SN35, a couple of Eucs, R30 or R35, and a miscellaneous selection in the far background, including more Euc/Terex loaders.....and lastly, the Cat 988 Dystred. We thank John for these blasts from the past, and look forward to some more in the near future. CEC DID IT LIKE THIS !! 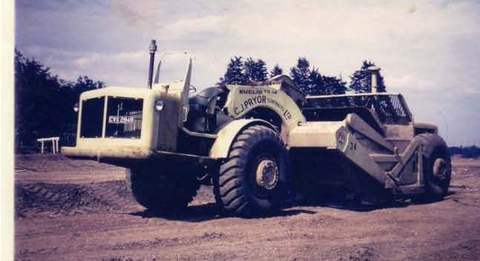 OF NORTHAMPTONSHIRE FARMING STOCK, CEC WALTON BEGAN LAND DRAINING SOON AFTER THE WAR, AND LATER IN HIS CAREER, WHEN HIS SONS HAD JOINED HIM IN THE BUSINESS, HE BECAME THE OWNER OF THE LARGEST FLEET OF TEREX 82-40`S OUTSIDE THE N.C.B., IN FACT THEY ALL CAME FROM THE N.C.B., MOSTLY VIA HUNSBURY MACHINERY. This article is from 1986 B.H.News, and Cec was long gone, but Peter & David Walton still carried on the busniess, even buying Zettelmeyer loaders as well to assist. The family also owns Bruntingthorpe Airfiled, where, amongst other things, is the home of the world`s only flying Avro Vulcan, X558......and not many people know this, but David actually bought X558 from the RAF, along with a shed load of spares, including 4 complete jet engines, back in the 1980`s, and although a trust eventually was created to overhaul and get the plane ready to fly, had it not been for the Waltons, a Vulcan would have never flown again. By the way, the word at the end of the headline is HELP !! 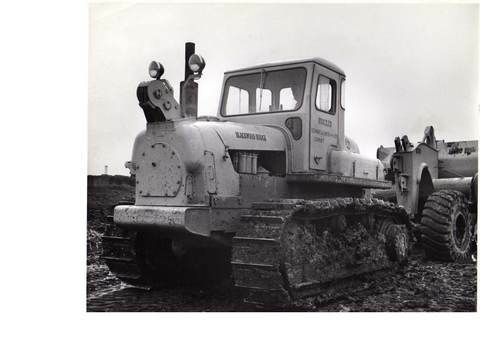 WE HAVE A SHORT STORY & A FEW PHOTOS FROM MR IVAN BARBER, ABOUT HIS FATHER ROY BARBER, & HIMSELF, WHO BOTH DROVE TEREX`S OVER IN EASTERN REGION AT DIFFERENT TIMES. ....Ivan has also worked for C J Prior, but only drove the Cat 637`s there, and never had the chance to drive Cec`s TS-14`s. One last image, nothing to do with either of the Barber`s, but one that Ivan has sent, showing the demise of an H&S driver at Northfleet called "Biggles", so named we assume because he thought he could fly, although this time, his R-25 "wing" appears to have fouled a conveyor on take-off !! ONE OF A.H.V-S`s MANY SUCCESSES. WE HAVE ALREADY BEEN RE-ACQUAINTED WITH TONY VERNON-SMITH BY HIS "SIGNING-ON " LETTER FROM LEONARD SUNLEY.
" Hello Ed. P.J.Conway is the company, and Eddie Dye was the Plant Manager, and they had the contract at Blue Circle, Northfleet, in Kent. 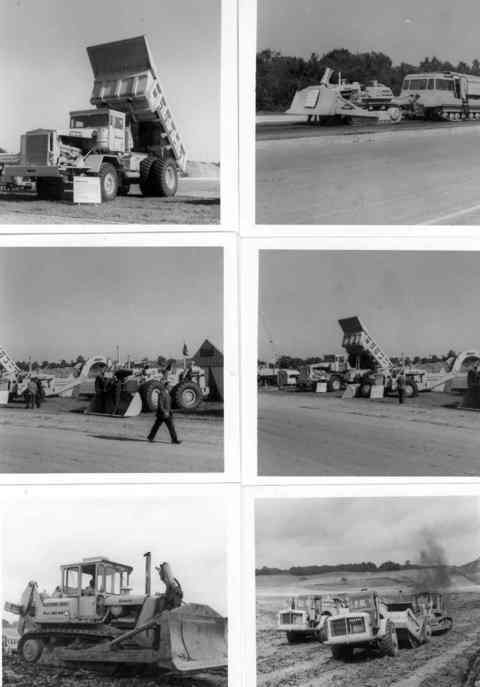 They were a very large user of Terex equipment, TS-24`s, 72-81`s, and a load of rigids. I think this photo is taken on the site of what is now the Blue Water shopping complex. A slightly more youthful looking A.H.V-S than todays model, but still easily recognisable !! HE IS DOING IT ON HIS OWN !! BRIAN REDMAN....WITHOUT HIM, THERE WOULDN`T BE AN EASTERN REGION !! Brian is currently making some jottings of his 17 years at the Hodge (in 3 sessions ! ), but he keeps feeding us some more photos for publication, so we have to keep updating his region. ......next a bunch of photos taken at the M.V.E.E !! You know what that is dont you ?? No ?? The Military Vehicle Experimental Establishment at Hurn, near Bournemouth ..... thought everybody knew that !! 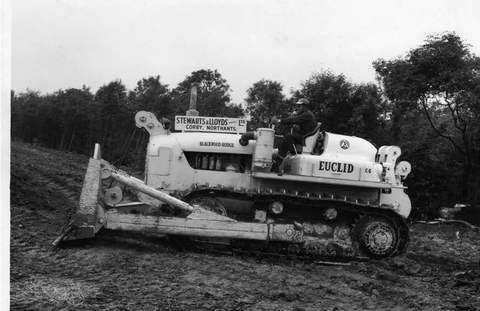 Brian reckons it was a bit of a "Hillhead" of its day, which was 1966, and some tasty Eucs on view....an R-45, what we think is an 82-30, must be a very early model, pulling a tracked command post (?? ), an 82-40 & a 72-41, both first produced in 1966, some TS-14A`s (not that they were A`s then), and a couple of tantalising half pictures of the TTS-14. Did nobody ever get a proper picture of that machine !!!! ....and lastly in 1968 or 1969, Brian is sent to London Docks (they still had them then, no high rise appartments in those days !!) 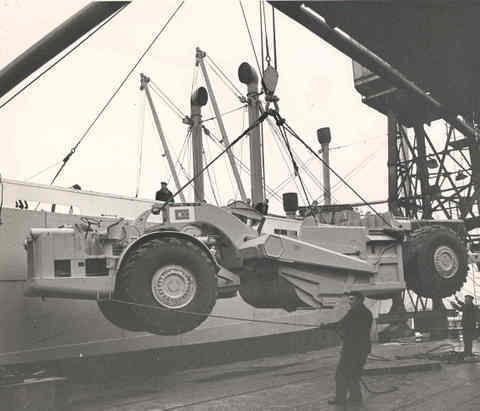 to assist the loading of some exports, namely B4LOT Cummins powered TS-24`s for Costain, maybe to Nigeria ?? Would anybody know ?? Fine photo anyway. EVER SINCE THE IDEA OF THIS BLOG WAS THOUGHT UP, WE HAVE BEEN BADGERING A.F. (ALAN) MATCHETT, THAT WELL KNOWN RACONTEUR AND BON VIVANT, AND PART-TIME RAMMER SALESMAN, TO GIVE US THE BENEFIT OF HIS EXPERIENCE IN WRITING AND PHOTOS OF HIS MANY EXPERIENCES OF THE INDUSTRY SO THAT WE CAN ADD TO THE WEALTH OF HISTORY WE ALREADY HAVE ON FILE. SO FAR, WE HAVE TO SAY THAT OUR PLEAS HAVE FALLEN ON DEAF EARS, SO JUST TO REMIND HIM OF HIS DIM (AND DISTANT) PAST, AND HOW GOOD HE WAS (IS ??? ), FROM THE 1978 JUBILEE NEWSLETTER, COMES THIS GEM OF LITERATURE ABOUT ONE OF HIS FAVOURITE SUBJECTS....BOOZE !! 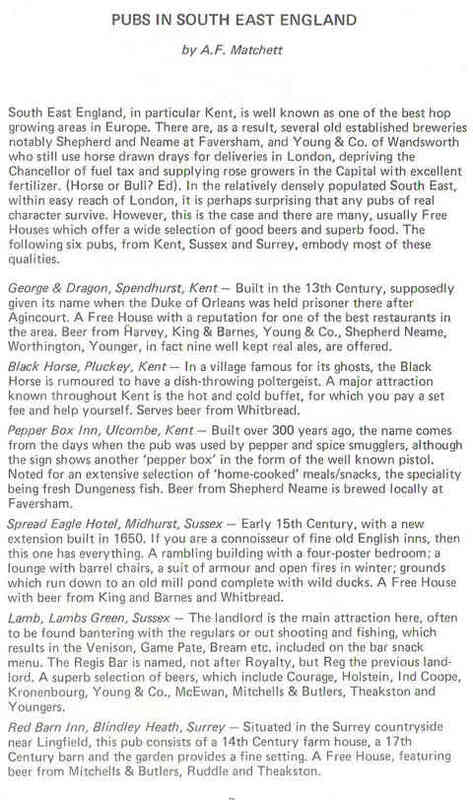 OF COURSE, IF HE FAILS TO COME UP WITH ANYTHING ELSE FOR OUR DELECTATION, HE WILL FOREVER BE REMEMBERED AMONGST HIS CONTEMPORARIES AS THE POOR MAN`S OZ CLARKE !!! 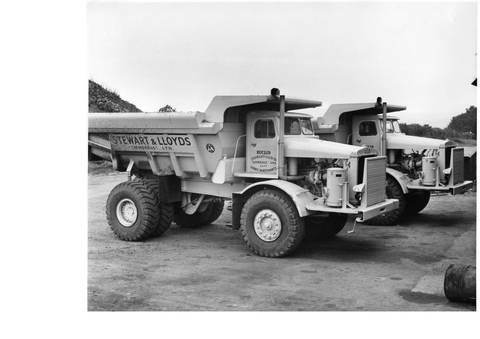 A COUPLE OF FINE PHOTOS WERE MISSING PRESUMED DELETED YESTERDAY WHEN THE STEWARTS & LLOYDS IMAGES WERE PUBLISHED, BUT THEY HAVE RETURNED, AND ARE NOW SHOWN BELOW. WE LIKED THESE TWO PARTICULARLY BECAUSE OF THE SPEC AND THE SET-UPS OF THE C6`S SHOWN, AND WE ARE ALMOST CERTAIN THAT THESE ARE TAKEN ON THE SITE IN CORBY, SEE THE WORKS BUILDINGS IN THE BACKGROUND. ...then the same, with C6 on blade doing the pushing. Love the cabs, never seen those particular ones anywhere before. 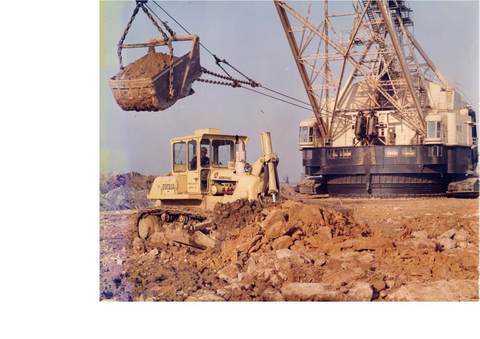 ....and lastly a classic, not only because it is a C6 in colour, but that it has in the background one of the pair of huge Ransome Rapier walking draglines, which were once so much a part of Corby`s skyline...it didn`t matter where you were in that area, those jibs were visible for miles !! The tractor would actually fit inside that bucket !! One of Cec Pryor`s TS-14A`s.....part of his fleet long before artic trucks were thought of !! 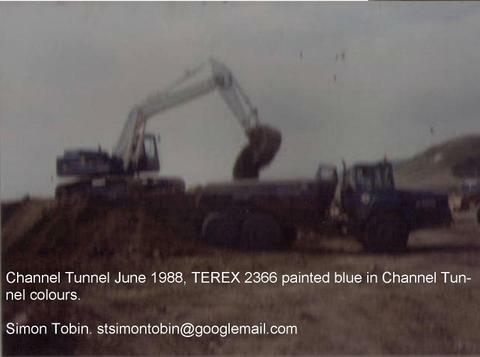 Simon Tobin, who spent a part of his career working for BH Hire, frequented the South East a lot, especially during the Channel Tunnel days. The photos he has are not the clearest, but he has added to them with his notes from the time, so we can see what was occurring. See also BH Overseas & BH Hire sections.